Grand Re-Opening A Huge Success! This past Saturday June 18th was the grand re-opening of the Harry Class Community Pool and 80th Anniversary. Attended by all three levels of government, community members, members of the design team, construction team, engineering teams and sub trades the day was a huge success! Featuring tours of the newly re-designed facility, a charity BBQ, aquatic demonstrations by local swim clubs, speeches and a free public swim, there was something for everyone! Despite the hot sticky weather, everyone donned their bathing suits and joined us at the pool to soak up the sun and take a dip in the pool. Thanks to everyone who came out to the event and supported the charity BBQ! We look forward to your comments on the new facility! This entry was posted in Uncategorized on 2011/06/22 by adminjma. Grand Re-Opening Set for Saturday June 18th! 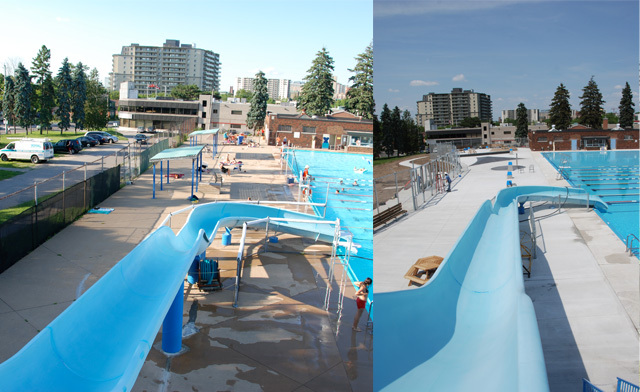 The grand re-opening, and the 80th anniversary of the Harry Class Community Pool here in Kitchener, is slated for this Saturday, June 18th at 12:30. Featuring a newly designed and fully accessible change house, complemented by an expanded deck with cedar benches, tanning mounds, and an outdoor shower, the facility is the ideal summer destination. Beginning construction in the late fall, our firm worked in close co-ordination with Dakon Construction and their many hardworking trades to complete the re-design of the change house and pool deck for the June opening. With the support of the community, we worked along with the City to collect input and gather information about how to best re-design the facility to benefit the community. Building off of everyones ideas and input the design team worked to create an inclusive space for the whole community to enjoy for years to come. Frequented by John and his family, and located only a short distance from our offices, this project is a proud achievement for the firm. 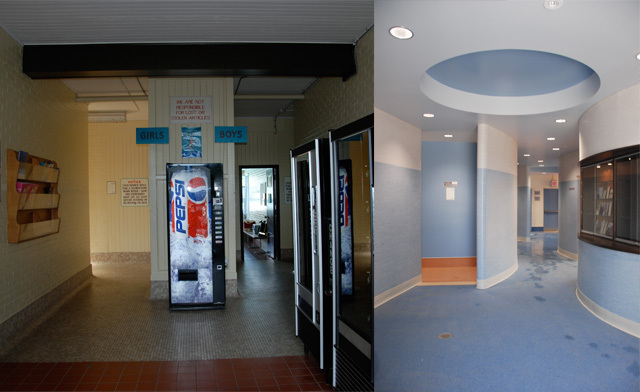 Built in the 1930s, the building was last renovated in 1968 and in much need of some updating and TLC. 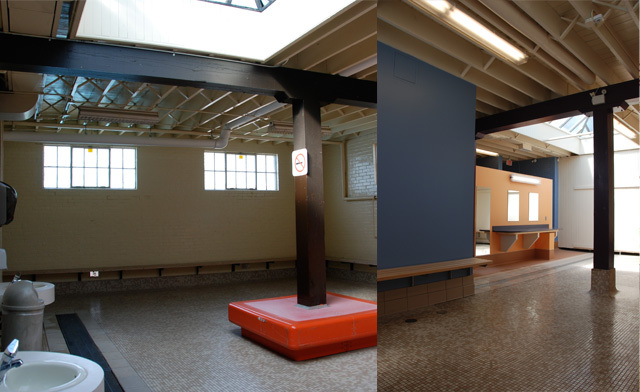 Although the project began with the idea of renovating the change rooms to allow for the creation of a family change, the City took the opportunity to give the entire change house and pool deck a much needed facelift. Adding some great colours in the interior and some dynamic curved walls, the team integrated the common showers into the space to allow for efficiency and create a fun playful environment. Covered with vinyl, the floors and walls in the main corridor were quite the challenge for both the contractor and its subtrade Volls, although they more than exceeded expectations! 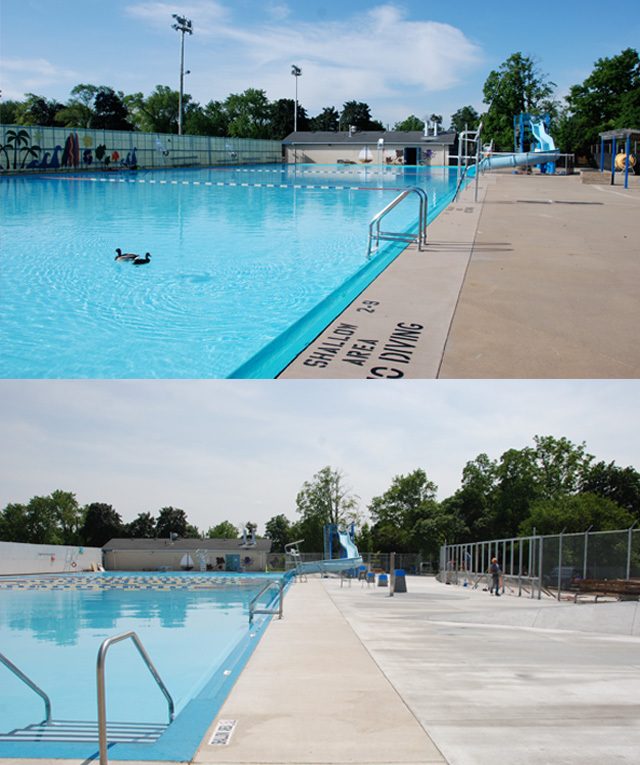 Replacing the pool deck, the team worked to design a larger, more user friendly environment, that increased the size and capacity through a larger footprint and added seating. Although budget determined the project would include a chain link fence, we worked to integrate curves, benches, and look forward to canopies for shade, nighttime lighting, and tables to be installed around the concrete posts on the pool deck in the future. Having an appreciation for the history of the facility, and its name, in recognition of the local swimming legend Harry Class, the project team, along with the community was very saddened to learn of the recent passing of Harry Class at the age of 95, and send our condolences to the family, friends and those touched by his life. It was the intention of the deisgn team from the beginning to recognize the achievements and contributions Harry Class made to the community, as we designed a memorabilia case in the main lobby to feature photographs and articles collected over the years. We hope you can join us on Saturday to celebrate the grand re-opening and 80th anniversary of the facility, and honor the achievements of Harry Class, and his contribution to the community. With a charity barbecue beginning at 12:30, aquatic sport demonstrations at 1:15, speeches at 1:30 and a free public swim at 2pm everyone is welcome to attend and tour the new facility. Hope to see you there! This entry was posted in Architecture, Community, Design on 2011/06/16 by adminjma. The leadership of the Region of Waterloo is grappling with whether to introduce a major new piece of public infrastructure, light rail rapid transit. There are many reasons to consider the decision carefully, including its expense, extent and timing, but one particular notion regarding light rail needs a thorough debunking: the idea that light rail transit is unique because it is primarily meant to support development opportunity in our communities, rather than act as simply transportation infrastructure. This element of light rail is cited by both its supporters and opponents as a critical component of their enthusiasm or disapproval for the option. What deserves airing and exploration is not whether light rail will shape future development. There’s no question that it will. What must be questioned in debating transit and transportation options is whether other forms of transportation infrastructure, in particular our road systems, aren’t also primarily and firstly determinants of community form. They are. Public investment in roadways is no less massive a shaper of our communities than light rail will be. We tend to view investment in new lanes for regional roads, upgrades to the 401 and Highway 7/8, and a completely new highway to Guelph as a logical response to traffic demand, rather than a primary driver for land development. Use of the public purse for these projects is comparable to the investment we now contemplate for public transit. Perhaps the only reason we are so uncritical of this practice is its sheer normalcy. We do it year after year after year, yet commute times increase as these projects create further low density development at the periphery of our communities and across productive farmland. Let’s think about when the Conestoga Expressway was itself a new form of public infrastructure. The decision to build the freeway must be seen in the context of the community form that it was meant to subsidize: a landscape of segregated land uses for shopping, living, recreation and working. This landscape requires extraordinary investments in personal vehicles, parking, asphalt and commute times for all of us. Without the original and ongoing public expense of the expressway, and continued yet largely uncritical funding of road projects, our low density community form, and the development industry that provides it, simply aren’t possible. Once built, these roads have operating and maintenance costs, like any other system of infrastructure. Recent reports have highlighted the magnitude of public investment that is required to fund existing patterns of residential and employment land development. We are coming face to face with the reality of this unsustainable landscape, for both our pocketbooks and our planet. The Record has reported that almost $500 million is required to eliminate the road maintenance backlog in the Region’s three major cities, with $35 million needed each year thereafter. Not for new lanes and roads, that’s just to maintain the existing. This figure doesn’t include the cost of plowing, policing, operating the road system, and public health costs. That requires still more public funds. Our mid-20th Century decision to invest in roads and commuting was primarily a decision about how our community would grow, and how such growth would be subsidized with public money. We’re paying dearly for that decision, and won’t be able to get off the treadmill of expense any time soon. As with the Expressway decision, our present debate about the nature of public investment is primarily about the shape and form of our community. Shall we accommodate growth with more lanes for cars and buses or an infrastructure of rail-based transit? All infrastructure creates development opportunity and tilts the landscape of private decision and investment. The choice we face is not whether to support private development with public money. We’ve done that for decades, and our communities have taken their present shape because of it. The real choice is where to support that investment going forward, using public funds wisely. Which choice leads to a sustainable future for our children? We are waking to the true expense of our experiment with segregated land use planning and the roadways that support it. Light rail rapid transit can provide a bright alternative to this grim future. Where the project is undertaken with prudence, it will strengthen our historic forms of settlement and help to retain our distinct rural landscape. It will create quality choices for all, by making a difficult decision that leads us in a new direction. This entry was posted in Uncategorized on 2011/06/10 by adminjma.